The ihalation therapy has several well-established advantages over the oral and intravenous (IV) routes: (1) A small dose of drug can be used; a few hundred micrograms of inhaled (3-agonist may be as effective as a 10-mg oral dose. (2) There is a rapid onset of action; an inhaled bronchodilator is effective within 5 minutes and reaches peak effect in 15 to 30 minutes compared to 2 to 3 hours for an oral dose. (3) There is a low incidence of systemic side effects; inhaled corticosteroids control asthma in doses far lower than those required to cause adrenal suppression. With the exception of several preparations that can be given as sublingual sprays for systemic therapy, it is a general rule that therapeutic aerosols should reach the lungs to be effective. A small part of the effect of inhaled E-agonists or corticosteroids may arise from drug either deposited in the oropharynx and absorbed locally or swallowed and absorbed from the gastrointestinal (GI) tract. Bearing in mind the small amounts of drug conventionally used, though, the majority of the effect arises from drug deposited directly in the lungs. For instance, 500 xg of terbutaline sulfate (the usual therapeutic dose) deposited in the upper airways gave rise to no significant bronchodilatation, and gargling with the same amount of fenoterol solution was also ineffective. Inhaled bronchodilators produce their maximum effect when plasma levels of drug are negligible. Thus, the first requirement of aerosol therapy is to get an adequate amount of drug into the lungs to achieve a full therapeutic effect. Once deposited, the action of the drug will depend on a range of physiologic and pharmacologic factors, many of which we cannot control. The ideal site of deposition within the lungs is not clear. The receptor sites for p-agonists occur predominantly in small conducting airways (<2 mm diameter), while those for anticholinergic agents, such as ipratropium bromide, may lie primarily in the larger airways. For the time being, however, our primary concern should be to ensure that inhalation devices produce aerosols small enough to enter the lungs and that these aerosols are inhaled in an appropriate manner. Within the respiratory tract, the drug concentration on the airway surfaces will not be even. The surface concentration will be highest in the central airways and will decrease as the lung periphery is approached, owing to the large increase in surface area. With a dose of 500 fig terbutaline sulfate from a metered-dose inhaler, it may be calculated that concentration in the large conducting airways ranges from 30 to 300 ng’cm2, with the peak concentration in the segmental bronchi (generation 3). In the small conducting airways (generations 9 to 16), the concentration ranges from 1 to 30 ng*cm2, but is <1 ngecm2 in the alveoli (generations 17 to 23). 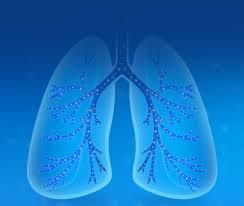 Several processes account for the deposition of aerosols within the respiratory tract. For the range of sizes encountered in aerosol therapy (approx 1 to 10 ft diameter), we can concentrate on only two mechanisms, ie, inertial impaction and gravitational sedimentation. A third mechanism—Brownian diffusion—is important for aerosols <1 x diameter, but therapeutic aerosols are seldom as small as this. Inertial impaction can occur either in the oropharynx or at bifurcations between the large central airways of the lungs. If the aerosol particles or droplets are sufficiently large, or if the air stream is moving rapidly, the aerosol may be unable to follow the air stream when it changes direction, and may impact on the airway wall. Any particle 2sl diameter can undergo this process. A turbulent air stream, which can occur at inhaled flow rates as low as 15 L-min, also enhances deposition in central airways, especially the trachea. Gravitational sedimentation can occur for those particles that escape deposition by impaction and that are able to penetrate to the more peripheral parts of the respiratory tract, ie, small conducting airways and alveoli. Here the air stream moves relatively slowly, and aerosol can settle onto the airway surfaces either during the course of slow, steady breathing or during breath-holding. These maneuvers allow a sufficiently long residence time of particles within the lungs for sedimentation to occur. Particles ^0.5 fi diameter are susceptible to this process. The rate of settling is proportional to the square of particle size. A 5|x diameter unit density particle settles at 0.7 mnrsec”. Particle or droplet size is potentially the most important factor determining the site of aerosol deposition. Table 1 shows the deposition of particles in the 1 to 8 size range inhaled by steady breathing in a normal subject, with “total” deposition taken as the sum of depositions in the oropharynx and in the tracheobronchial and alveolar zones of the lungs. For particle sizes <2 |x diameter, most of the aerosol is deposited in the alveoli (by gravitational sedimentation). As the particle size is increased alveolar deposition reaches a peak at —3 |i and then decreases, while tracheobronchial (conducting airway) deposition increases, ie, there is a shift in deposition from peripheral to more central parts of the lungs. When deposition is plotted as a function of airway generation, particles in the 1 to 5 |i range show peak deposition in the small conducting airways and alveoli, while particles in the 5 to 10 fjL range have peak deposition in the large conducting airways. Perhaps most important, however, is the rise in oropharyngeal deposition with increasing particle size. The probability of deposition in the oropharynx may exceed 50 percent for an 8-|x particle and is approximately 100 percent for a 16-ц, particle. This places a practical limit on how large a therapeutic aerosol should be if enough of the drug is to enter the lungs at all. Particles <5 |i diameter can be taken to constitute an arbitrarily defined “respirable range” for therapeutic aerosols, although even within this size range, some particles will be deposited in the oropharynx and some will be exhaled. Most therapeutic aerosols are heterodisperse; in other words, the particles or droplets in any spray cover a range of sizes. The mass median aerodynamic diameter (MMAD, ie, the size such that half of the mass of the aerosol is contained within larger droplets and half within smaller droplets) is used to describe such an aerosol. Aerodynamic diameter is the product of physical diameter and the square root of density. It should be borne in mind that some therapeutic aerosols are hygroscopic and grow in size within the warm, humid environment of the lungs. Aerosol deposition varies considerably from one person to another, partly because of random variations in airway geometry which affect the probabilities of impaction and sedimentation. Hence, while it may be possible to specify the average amount of aerosol reaching the lungs in a group of subjects, there will be a range of deposition values between individuals. The degree of airway obstruction also affects the site of deposition. Once aerosol has entered the lungs, deposition by impaction in central airways is more likely in patients with asthma or bronchitis, whose airways may be narrowed by a combination of bronchospasm, edema, and mucous hypersecretion. However, this effect is probably not very marked in the case of aerosols released from metered-dose inhalers. Airway obstruction does not seem to prevent successful aerosol therapy, unless the airways are actually plugged with mucus.